If you’ve ever felt intimidated trying to navigate your way around the gym, you’re not alone. From the talkative salesperson at the front desk to the seemingly endless rows of confusing cardio equipment, the gym can leave some people feeling too anxious to workout at all. Whether you’re looking to shed some pounds or just want to feel better about yourself, research has shown there are more than a few reasons why working out may have absolutely nothing to do with weight loss. Looking to gain more energy, reduce stress, or feel more confident? The gym could be the answer – if you aren’t too uncomfortable to go. To learn more, we surveyed 1,000 Americans to get their take on how often they felt judged while at the gym and how often they judged others. Curious what could be holding you back from feeling better about your body, and what you might be able to do to overcome these insecurities? Read on to learn more. Feeling anxious about going to the gym might not be all in your head. In fact, some national gym chains have used marketing ads that body shame people into working out. Research has shown these “scare tactics” are generally unsuccessful and can have the opposite effect of what they are trying to achieve. According to respondents, more than half avoided the gym in response to anxiety or fear of judgment.This includes 36 percent of men and nearly 65 percent of women that have become apprehensive about working out at the gym because of what other people thought. Additionally, getting the jitters about going to the gym was more common among men and women who felt they were less attractive, less in shape, or less experienced at the gym than people who were more confident in their body and skills. Even exercise preference played a role in the likelihood of people avoiding the gym. The most anxious gymgoers? The flexibility and aerobic crowds. According to some, the science and assumptions behind why stretching matters don’t always align, and common cardio questions (like whether running outside or on a treadmill are the same) can leave a person feeling uncomfortable at the thought of cycling, swimming, and jogging. The fitness journey is different for everyone. Still, body shaming can happen anywhere and to anyone – particularly a person's weight. Nearly 52 percent of men and almost 65 percent of women admitted they felt judged by others at the gym because of their weight. Body shaming doesn’t just happen while working out, but it could be one of the biggest anxiety-inducing issues keeping people from achieving their fitness goals. If the equipment at your gym needs extensive explanation or instructional diagrams, it might be too confusing for the average user. Nearly 59 percent of women and around 44 percent of men felt uncomfortable at the gym because of their improper use of the equipment. Whether it’s for function or aesthetic, nearly everyone has an opinion on what you should (or shouldn’t) wear to the gym. Perhaps all of these rules are what’s given so many respondents anxiety about their next gym session. 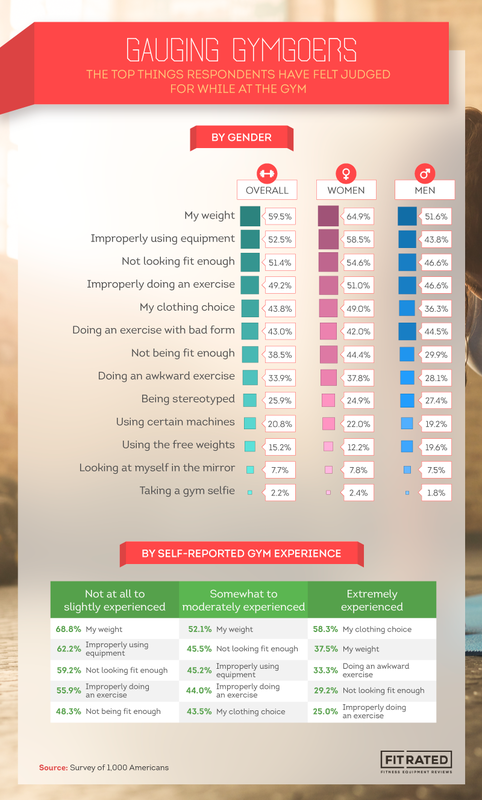 Over half admitted to not looking fit enough to be at the gym, and nearly 44 percent said they felt judged for their clothing choice. We asked people to tell us what held them back from going to the gym. The words “people,” “look,” and “fat” were among the most common reasons expressed. Even if you don’t necessarily have ill intentions, the things you say to other people at the gym could still be perceived as hurtful. Working out in front of other people can be intimidating, and participants acknowledged feeling vulnerable for many reasons, including their weight, experience, and general appearance at the gym. Still, more than 1 in 3 respondents admitted to judging others while at the gym. While slightly more common among men than women, our survey found people who felt somewhat or moderately attractive or were able to navigate the gym with ease were more likely than those who felt extremely attractive or experienced to be judgmental of others. Experts on the subject have suggested the false sense of superiority a person imposes on others could be a mechanism to feel better about themselves. Not only did exercise preference affect participants’ likelihood of avoiding the gym – but it also correlated with how likely they were to judge others. Those who prefered anaerobic exercises such as weightlifting were the most judgmental group of gymgoers followed by those who prefer aerobic exercises which includes things like running and cycling. If you can look past the ads and commercials making your gym seem like a meeting place for the young and beautiful, you may realize the gym is meant to make you feel better about yourself, not worse. Downloading a motivational music playlist to boost your confidence or even finding a partner to share your fitness journey are just a few ways to combat the anxiety you might experience while at the gym. In reality, respondents were more than twice as likely to feel judged at the gym than to pass judgment. While weight and equipment knowledge gave Americans the most anxiety, people who were critical of fellow gymgoers were more concerned about what other people wore than how they worked out. Activewear doesn’t just have to be for activity, and some styles (like yoga pants and leggings) have become so popular that they’re changing the face of the apparel industry altogether. In fact, activewear shoppers in their 20s and 30s are 51 percent more likely to spend more than they can afford to get the clothes they want. Participants were also more likely to feel judged for improper exercises and form than they were to actually be judged for it. If you think the gym is a good place to pick up a date, you might want to reconsider. Not all women (or men) have the same attitude toward getting hit on in the middle of their workout, and for some, it can be a complete turn-off. While less common, over 5 percent of women and more than 1 percent of men admitted to being sexually harassed at the gym. While some offenses may be much more obvious (like snapping pictures of someone without their consent), the most common forms of harassment can be somewhat more subtle. Nearly 69 percent of people experienced being unnecessarily stared at, while nearly as many received comments about their appearance. Additionally, 1 in 5 people were touched or groped. Others gymgoers committed a majority of these sexual offenses, but more than 1 in 10 people said gym staff or trainers participated in these inappropriate behaviors. Regular and consistent activity is one of the most important elements of people’s physical and mental health. Not only does it help control weight or combat health concerns caused by a sedentary lifestyle, but it can also make people feel better about themselves and their bodies. There’s a near endless arsenal of excuses for not going to the gym today. You might think you’re too busy, tired, or even afraid. However, there’s only one reason why working out is more important than sleeping in or binging on Netflix: you. Your physical and mental health depends on just a few minutes each day of moderate exercise. We surveyed 1,000 Americans about their fears and anxiety related to the gym to see who and what causes gymgoers to avoid going or to feel judged or anxious during the time they’re there. Ready to shake off the jitters and hit the gym? We’re with you. Feel free to share the results of our study on your website for any noncommercial use. Just ensure a link back to this page, so your readers can see our research in its entirety and our contributors earn credit for their work.